Our logo is a stilyzed giant anteater, a beautiful animal from the brazilian fauna. 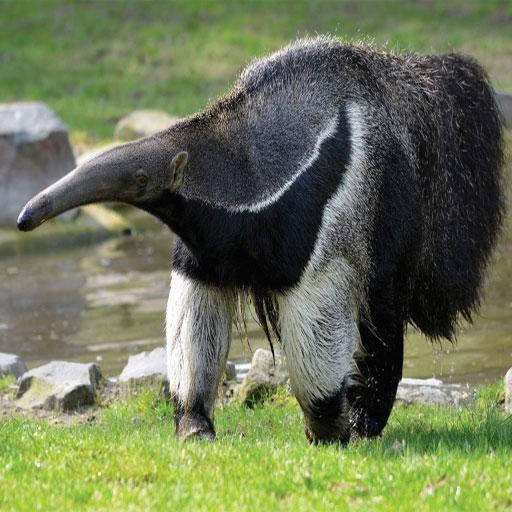 The giant anteater (Myrmecophaga tridactyla), also known as the ant bear, is a large insectivorous mammal native to Central and South America. It is one of four living species of anteaters and is classified with sloths in the order Pilosa. This species is mostly terrestrial, in contrast to other living anteaters and sloths, which are arboreal or semiarboreal. The giant anteater is the largest of its family, 182–217 cm (5.97–7.12 ft) in length, with weights of 33–41 kg (73–90 lb) for males and 27–39 kg (60–86 lb) for females. It is recognizable by its elongated snout, bushy tail, long fore claws, and distinctively colored pelage. The giant anteater can be found in multiple habitats, including grassland and rainforest. It forages in open areas and rests in more forested habitats. It feeds primarily on ants and termites, using its fore claws to dig them up and its long, sticky tongue to collect them. Though giant anteaters live in overlapping home ranges, they are mostly solitary except during mother-offspring relationships, aggressive interactions between males, and when mating. Mother anteaters carry their offspring on their backs until weaning them. The giant anteater is listed as Vulnerable by the International Union for Conservation of Nature. It has been extirpated from many parts of its former range, including nearly all of Central America. Threats to its survival include habitat destruction, fire, and poaching for fur and bushmeat, although some anteaters inhabit protected areas. With its distinctive appearance and habits, the anteater has been featured in pre-Columbian myths and folktales, as well as modern popular culture. These are the nerds that we hold captive to work for us.